The French vote was being closely watched as a bellwether for populist sentiment. THE EURO ROSE sharply today as markets breathed a sigh of relief as first-round numbers showed centrist French presidential candidate Emmanuel Macron leading far-right eurosceptic Marine Le Pen. In Asian trading, the European single currency was at $1.0849, against $1.0726 on Friday. It had risen as high as $1.0937 earlier today, up about two percent from last week. Against the Japanese currency, the euro was trading at 119.31 yen, against 117.07 yen on Friday in New York. It hit 120.91 yen earlier. Market-friendly Macron, a former banker and economy minister, won 23.9 percent of votes in yesterday’s first round, slightly ahead of National Front (FN) leader Le Pen with 21.4 percent, according to near-final results from the interior ministry. The two go through to a second round on 7 May. Nine other candidates were eliminated. A victory for Macron would make him the country’s youngest leader in modern history. 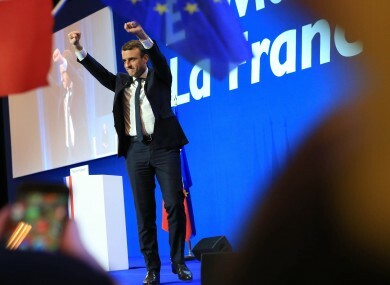 “Markets are happy to buy what they see as the fact — that 39-year-old Emmanuel Macron will be confirmed as the next president of the French republic in two weeks’ time,” Ray Attrill, head of FX strategy at National Australia Bank, said in a commentary. The euro’s rally highlighted how many investors were nervous ahead of the vote, analysts said. “The market’s initial reaction was stronger than expected — it means that many people had their guard up ahead of the vote,” Yuji Saito, Tokyo-based forex director at Credit Agricole, told AFP. There were many factors that required caution. It was a tight four-way race and tough to predict the outcome. Neither candidate from the mainstream Republicans and Socialist parties made it through to the second round for the first time in six decades, in a major shake-up of national politics. Among those failing to make the cut was Communist-backed eurosceptic Jean-Luc Melenchon, who had enjoyed a late surge ahead of the first-round vote in an election marked by widespread disillusionment with the political class. “Markets will be reassured that the dreaded Le Pen versus Melenchon run-off has been avoided,” Diego Iscaro at research house IHS Markit Economics said in a commentary. The second round will come down to a battle between the pro-European, pro-globalisation vision of Macron and Le Pen’s hostility to the EU and NATO. Her critics accuse her of sanitising the image of Islamophobia, anti-Semitism and racism associated with her firebrand father, who started her far-right FN party. Le Pen has predicted the EU “will die” and has vowed to take France out of the euro and hold a referendum on membership of the union. The proposal has caused alarm, with most polls showing the French against a “Frexit” or a return of the franc, fearing chaos for the eurozone’s second-biggest economy. Le Pen has downplayed the risks, accusing sceptical rivals and economists of scaremongering. Email “Euro surges despite Le Pen making second round of French elections”. Feedback on “Euro surges despite Le Pen making second round of French elections”.